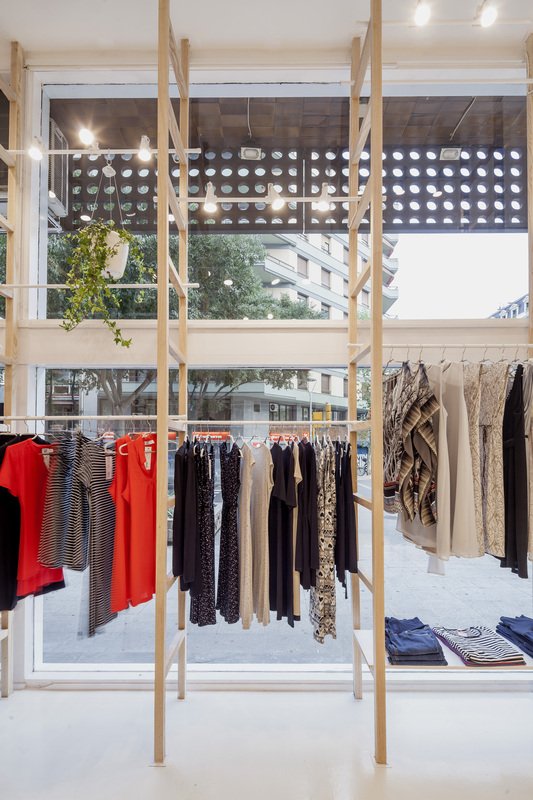 Architect Román Izquierdo Bouldstridge was commissioned to design a store front for maternity brand “Mit Mat Mama” in the Eixample district of Barcelona, Spain. 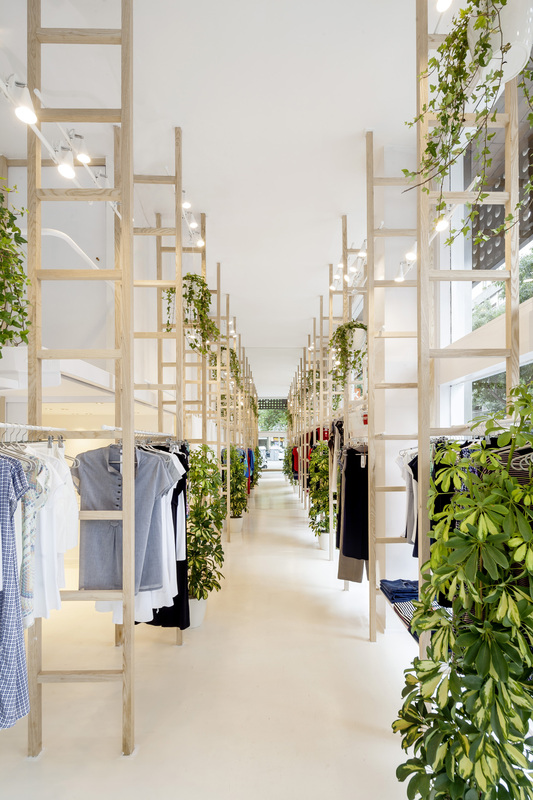 The main concept was to create an atmosphere where products and architecture came together in a harmonious nature filled with plants and natural light. 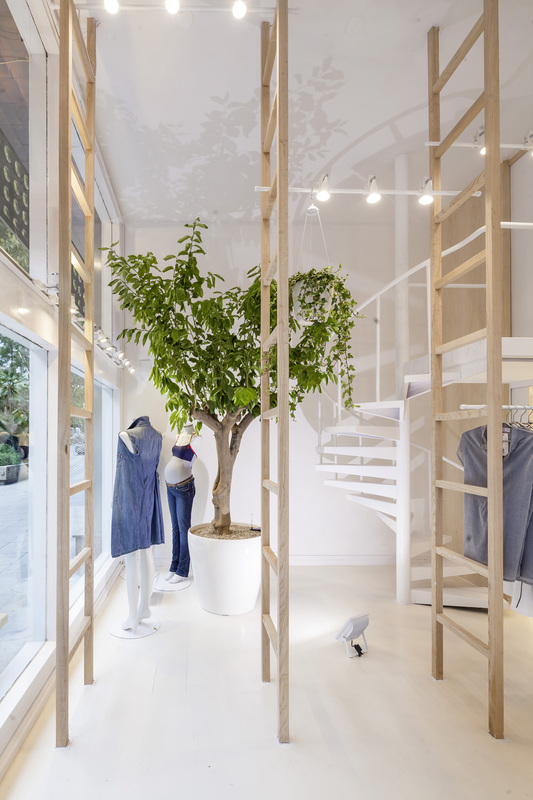 At the entrance, two mannequins beneath a lemon tree are immediately visible, followed by several American ash timber ladders and a spiral staircase. 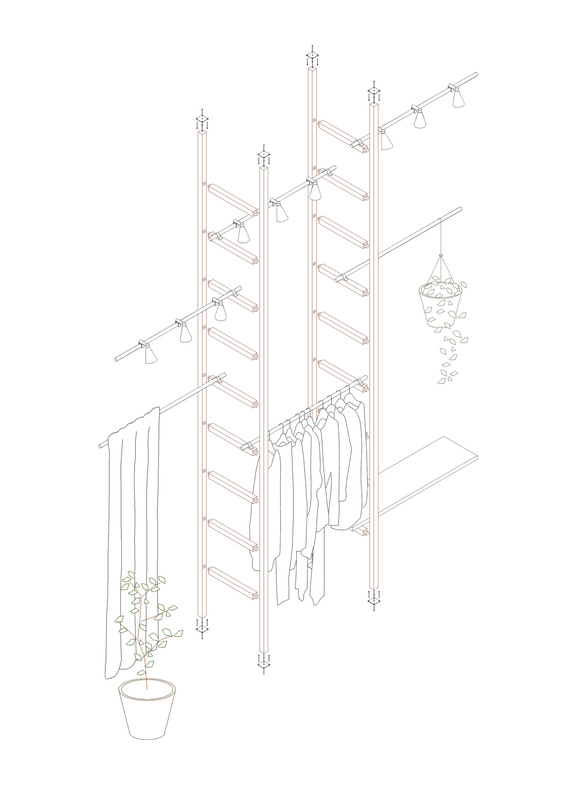 The ladders act as the main design element, and set a strict vertical rhythm throughout the entire interior. The path ends with a large mirror that effectively doubles the visual experience of the space. 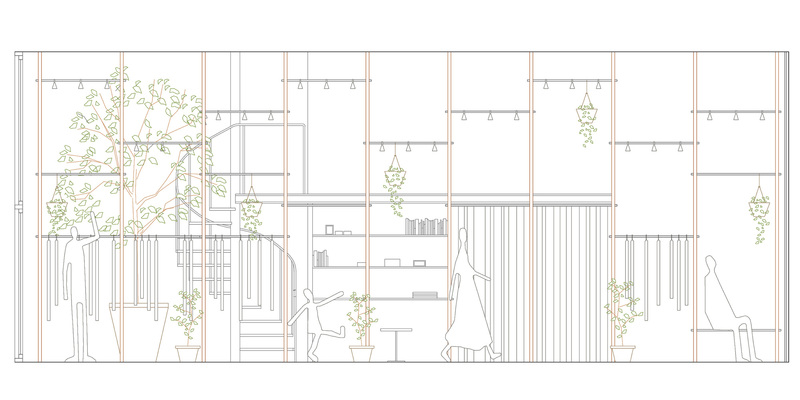 White steel bars and various plants are randomly placed, giving the storefront a dynamic feel that also happens to be easily adaptable. The first strategy was to join all the services such as the till, the fitting rooms, the toilet and a loft for storage, together in a longitudinal line. The aim was to open up the maximum space for clothing display. The storage space is accessed by a white steel spiral staircase, which it is presented as a sculpture from the entrance. 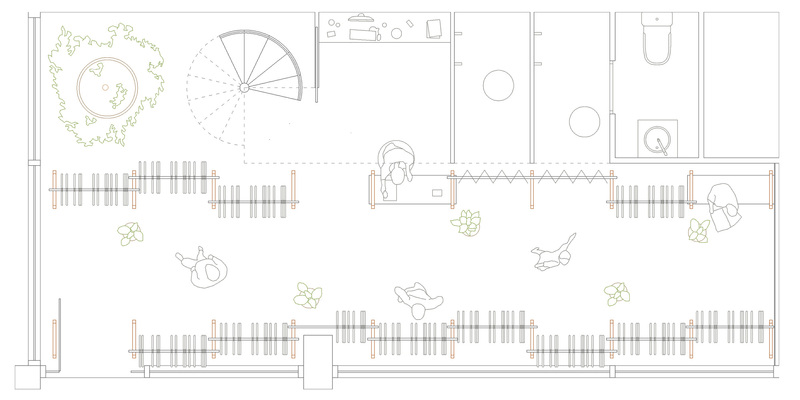 This design decision leads to an open, bright, airy space with a height of 4 meters and a direct connection to the street. The shop window is the shop itself. 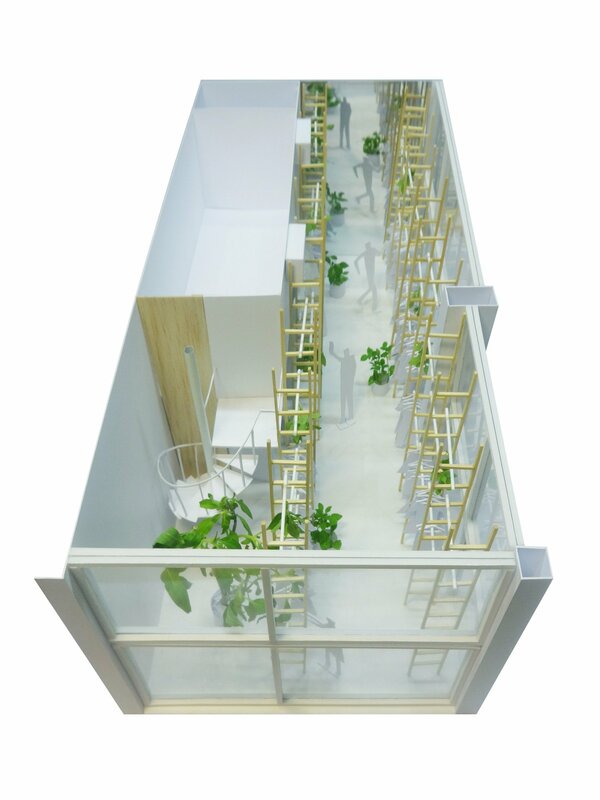 Several wood benches expand the store to the outside, inviting future clients to enter. The street is also the shop. The second strategy of the project is to create a modular system that solves all the required functions, meeting the conditions of low budget and restricted construction time. The main structure is two rows of ten American ash timber ladders placed perpendicularly to the street. 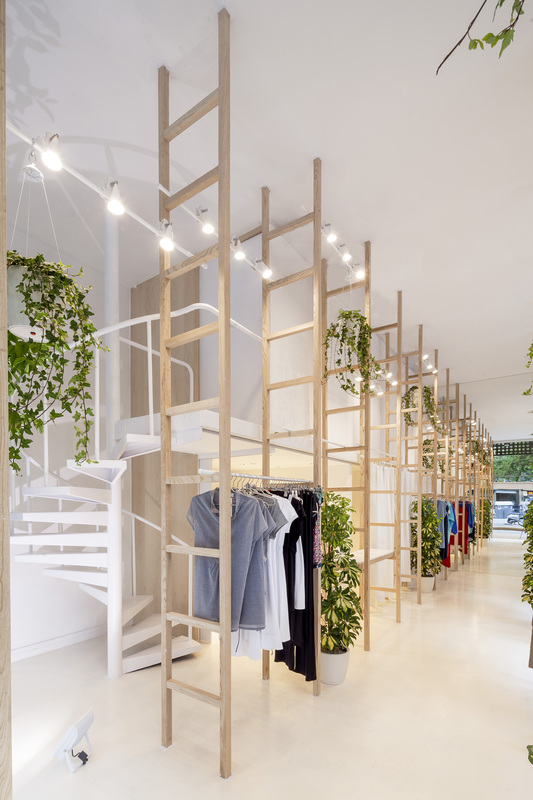 The rungs of the ladders support the white steel bars and the white wood boards. White steel bars and the white wood boards have different functions depending on the height at which they are placed; at 40 centimeters, the board is a bench while at 80 centimeters it is a desk for the till. At 160 centimeters, the steel bars are used as clothes hangers while at 200 centimeters they hang fitting room curtains. 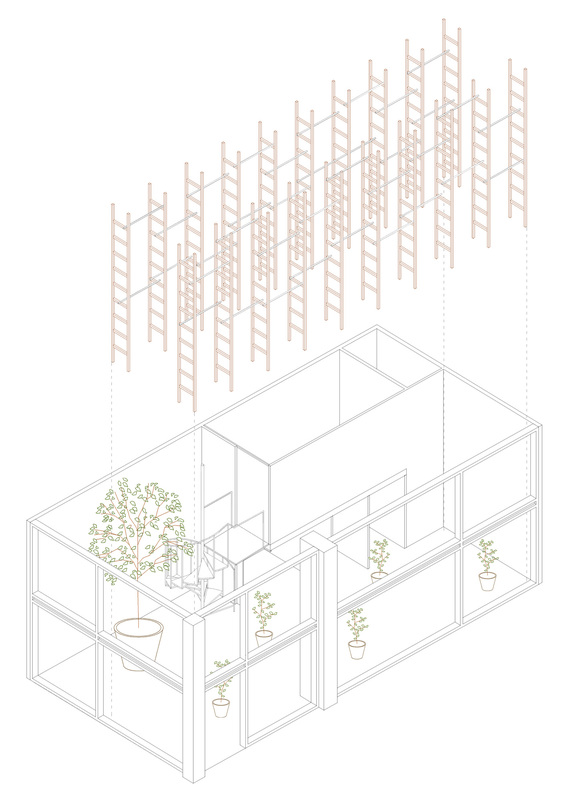 At higher levels, the steel bars hold the plants pots and lighting system. The flexibility of the system allows modifying the location of steel bars and wood boards without altering the initial concept and providing different functions.